The third estimate for how fast the economy grew last quarter is out, and the answer is 4/10 of one percent. 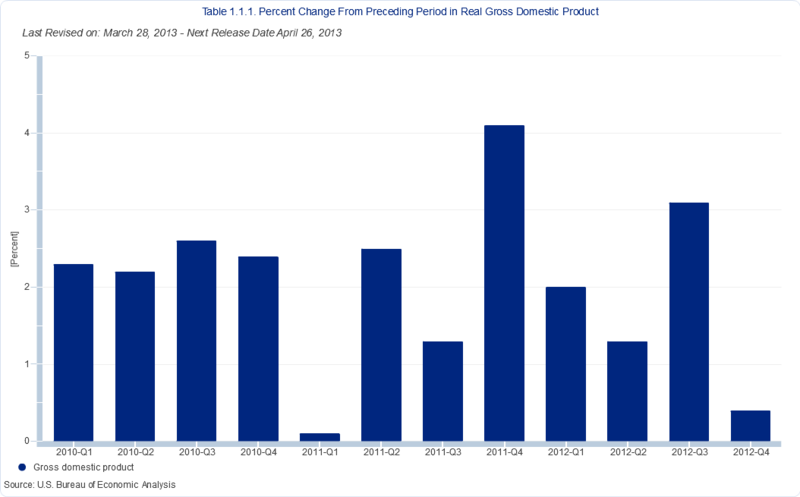 Real gross domestic product — the output of goods and services produced by labor and property located in the United States — increased at an annual rate of 0.4 percent in the fourth quarter of 2012 (that is, from the third quarter to the fourth quarter), according to the “third” estimate released by the Bureau of Economic Analysis. Growth of 4/10 percent is too slow for many commercial real estate projects to be feasible, but New Orleans commercial real estate thrives on tourism and the hospitality industry and has proven to correlate less with the national trend. Governments are unique entities that get several attempts to estimate data, unlike the private sector that only gets one shot to forecast trends and does so with often incomplete data. GDP is estimated by the Bureau of Economic Analysis. First, they release the advance estimate, then the 2nd estimate and then the final and 3rd estimate. 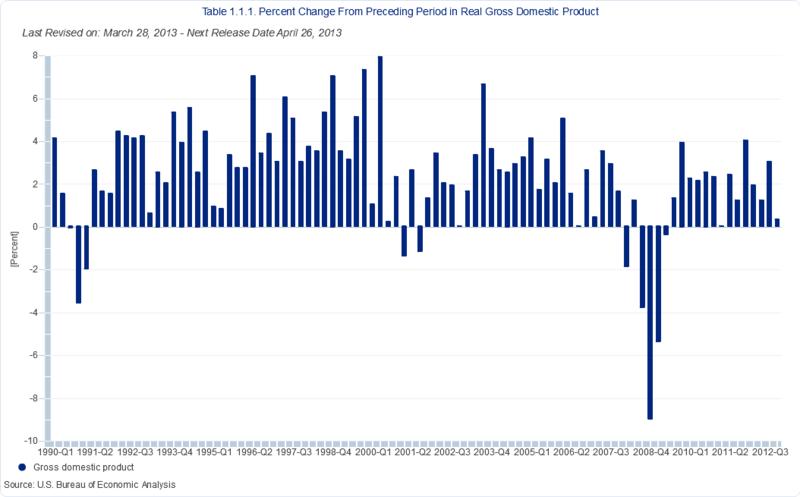 In the third quarter, real GDP increased 3.1 percent, so growth, while still positive, slowed dramatically. The GDP estimate released today is based on more complete source data than were available for the “second” estimate issued last month. The table below shows all three estimates for 4Q 2012 GDP. The increase in real GDP in 2012 primarily reflected positive contributions from personal consumption expenditures (PCE), nonresidential fixed investment, exports, residential fixed investment, and private inventory investment that were partly offset by negative contributions from federal government spending and state and local government spending. Imports, which are a subtraction in the calculation of GDP, increased. The chart below shows GDP growth since 2010 has been positive but inconsistent, making it difficult for businesses to commit to long term investment and adding people to the payroll. Growth in the 4th quarter of 4 tenths of one percent is slow growth, and the chart below of the longer term trend in GDP shows that of the 88 quarters since 1990, there were only 5 quarters of similar slow growth plus 3 recessions of negative growth.